We all know how fast the area is growing, and the perpetual construction of I-26 between Summerville and Charleston is certainly a symptom. Even though traffic continues to grow, adding lanes will not solve this problem alone. Using public transportation, working remotely, moving near your office, and carpooling are all things you can do to help curb your car. 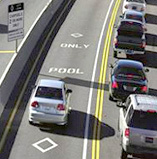 Many cities have built high-occupancy vehicle lanes that allow carpoolers to use special lanes on the far left. This is a great incentive that encourages ride-sharing, and one that may work well here in the Lowcountry. Any way we can keep cars off the roads, and get others thinking about their own driving habits, is a positive step towards a more sustainable future. SCDOT is wondering what you think about HOV lanes, and have opened a public survey to find out. Please take the survey before they close it on October 22nd, or visit their website for more information. Public meetins are also being held on the issue, so it’s not to late to get involved.